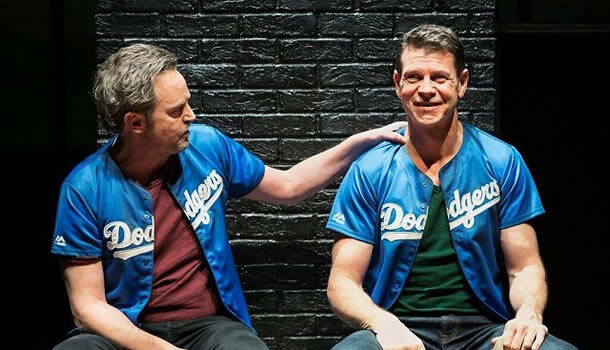 More and more, commercial theatre is becoming a playground for producers who prefer stunt-casting over inventive productions that push boundaries and surpass expectations. Sure, Matthew Perry wrote as well as stars in The End of Longing, but the sheer fact that he supposedly penned the script in a week should set alarm bells ringing. It’s a production that you really want to like. The End of Longing opens promisingly, with four brief monologues that introduce us to the four characters. We encounter an alcoholic Jack, awkwardly played by Perry himself, neurotic Stevie, prostitute Stephanie and Joseph who simply tells us that he is “stupid.” Already, we are faced with a myriad of clichés, but we forgive this in hope that it will all have a point. Unfortunately, the bulk of the dialogue remains about as superfluous and unnatural as these four unrealistic characters who have been forced together to represent a dodgy US sitcom. Jack struggles with alcoholism, much like Perry himself, and there is little more to him than that. Whether nerves got the better of him, or whether we are used to seeing him behind a screen, Perry seemed very uncomfortable onstage, stumbling over lines and ultimately lacking the stage presence that is so desired for a protagonist. Christina Cole and Jennifer Mudge showed promise as friends Stevie and Stephanie, but both characters were so stuck in stereotypes that they really had little to work with. How often do we see prostitutes and women-desperate-for-a-baby in theatre? It’s been done, a lot. Lloyd Owen provided some lighter moments as the dumb sidekick Joseph, giving one of the better performances despite a lack of material. Directed by Lindsay Posner, the play took on a very similar feel to a sitcom, with scenes lasting for mere minutes before a blackout into the next vignette. Lines were spouted quickly, with very little pause for the audience to actually take in the dialogue or revel in the more comic moments. Characters lacked depth and authenticity, which made it difficult to care about what happened to any of them. Anna Fleischle’s design kept the piece running somewhat smoothly however, with a chic set that rose up and down like a yo-yo and thumping music that pulled us straight into urban LA. Although there were some moments of potential, The End of Longing is ultimately hindered by a weak script which has resulted in some very wooden direction, and a play that really has little purpose. It’s such a shame to see shows such as the National Theatre’s Jane Eyre depart without a transfer when really; it’s imaginative, focused productions such as these that should be filling our West End theatres.